Google Home vs Apple HomePod: Which One Is For You? With so many options that seem so similar, it can be hard to figure out which smart speaker is the best choice to welcome into your home. While Apple's HomePod was released after the Google Home, they are far closer in age than you might expect. Deciding whether HomePod or Google Home is the best device for you depends on how you plan to use it. Both speakers can do the same kinds of things—answer questions, set timers, control smart-home devices, stream music—but they ways they do them, and the tools they use, can be pretty different. This article compares the two devices in 9 key areas to help you decide Google Home vs. Apple HomePod. The thing that makes a smart speaker smart is the intelligent assistant that listens for your voice and responds to your commands. It's not the only factor in deciding which speaker is best for you, but it's a big one. There's no question that Google Assistant is far ahead of Siri. Siri can respond well to a limited set of commands and questions, but Google Assistant can respond well to a wider set of scenarios and draws from a larger pool of information. One of the best things to use smart speakers for is streaming music. Just shouting out "play some happy music" is both a fun trick and a great mood lifter. Both devices can stream the most popular services. Both speakers can play virtually any streaming music service you prefer. The difference is really native support. HomePod delivers native Apple Music support, meaning that it can be controlled via voice, but supports all streaming over AirPlay. The same is true for Google Home, except it has native support for Google services and streams over Bluetooth. Your preferred service should guide your decision, but fundamentally, you can stream virtually anything on both devices. The range of music services supported by a smart speaker isn't the only thing to pay attention to. You want the music or podcasts you're listening to to sound fantastic. Best sound quality among all smart speakers, according to many different tests. Apple has positioned HomePod as an audio device first, a smart speaker second, and it shows in the sound quality. HomePod sounds clear, detailed, and huge. Home, on the other hand, delivers decent sound, but can't match the room-rattling HomePod. If you're making your home smarter with internet-connected, app-controlled smart-home gadgets, both HomePod and Home can help. You can speak to either device and ask them to raise or lower the temperature, turn off the lights, or perform any number of other tasks. While neither Google Home nor the HomePod support as many smart-home devices as the Amazon Echo, both of them work with most of the major offerings. HomePod has the added benefit of HomeKit support, which means devices can be controlled from your iOS devices as well. Double check that your preferred smart-home gadgets work with the speaker you're interested in, but you shouldn't run into many problems. With a smart speaker in your house, sending texts and making phone calls doesn't require your smartphone—but both Home and HomePod have some notable limitations in these areas. Both devices have significant limitations and it's hard to say which will be fixed first. HomePod perhaps has a slight edge, since it can support both calls and texts, even if not totally smoothly. Google Home, on the other hand, can only send texts with awkward workarounds. Still, neither option is ideal. Different rooms and uses may call for smart speakers that come in different shapes and styles. Three different sizes for different uses and rooms: original Home, a six-inch-tall cylinder in different colors; Home Mini is like a small lump of pizza dough; Home Max is like a larger Bluetooth speaker or the Sonos PLAY:3. The HomePod is typical of Apple hardware: beautifully designed, built to the highest standards, but also somewhat limited in its style options. If versatility and adaptability is what you want out of your smart speaker, Google Home—with its set of different sizes and shapes, and multiple colors—is your best bet. If you've got more than one person in your household, you'll have more than one person who wants to use your smart speaker. But different smart speakers work with multiple users in different ways. The HomePod's single-user support is deeply limited for multi-person households, putting it behind Google Home (and very far behind the Amazon Echo, which has pretty sophisticated multi-user support). 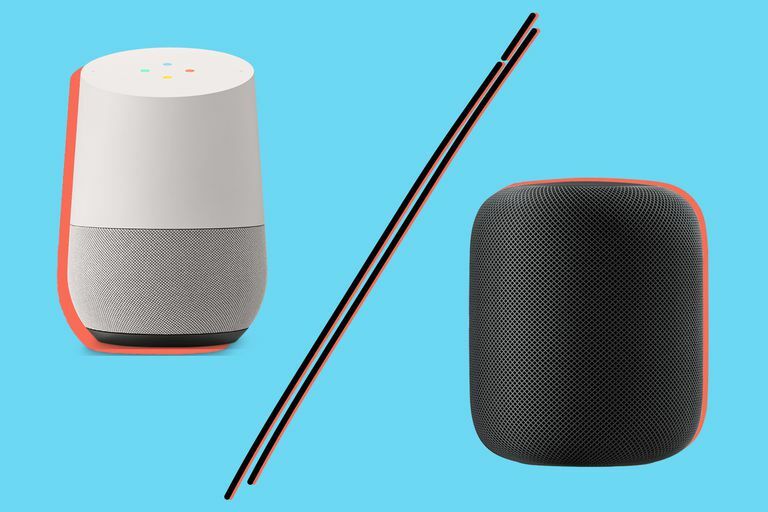 Between these two devices, only Google Home offers anything approaching a tool that works for the whole family. When buying a smart speaker, make sure you get one that works well with the broadest range of services and gadgets that you already have. That kind of compatibility makes these devices most useful. Like the streaming music services category, this one is mostly a toss up that is determined by what ecosystem you're aleady invested in. If you've already got a lot of Apple products, HomePod will interoperate with them smoothly and offer deep connections. On the other hand, Google fans will find Home gives them the best experience. It's probably fair to say that both Google Home and Apple HomePod are behind the Amazon Echo in terms of features, third-party app support, and speed at which they're developing. But Echo isn't part of this comparison. When comparing just Google Home vs. Apple HomePod, Home stands out thanks to its more advanced features, multi-user support, and third-party apps. The smarts in the smart speaker are also a big advantage: Google Assistant is a lot smarter than Siri. HomePod is a great device if you primarily want to use it for music and other audio playback. But if you're looking for a versatile smart speaker with a well-rounded feature set, Google Home is the pick.